Hello KY Farm, Kentucky, Lorelei Sanders shows us a gimongous young pup. Lion Flower Farm, Colorado, - Clementine and her piglet buddy. Flower Lion Clementine with stable buddy. 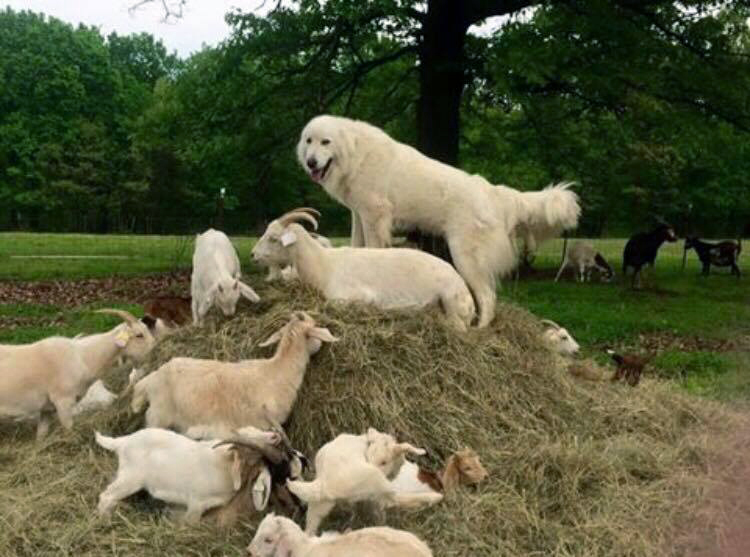 Painted Canvas Farm's "Chuck Norris", in Missouri, playing King of the Mountain with his Kiko Goat herd. Stephanie Skurdahl's dog, Toby, in Mew Mexico, finds a new calf and settles down to protect it until the humans arrive. This is the classic pose... relaxed, eyes averted so the animal will feel comfortable. His presence and pose is deliberate. Not all CMDs work on farms. In Colorado many families go up into the Rockies to camp, fish, and hike. CMDs guard their people on these expeditions. Klondike out hiking with Katie and Bobby Resch. Beautiful Otzi, owned by Kimmy Wooten. Kimmy and Otzi on the trail. Photographer Elizabeth Gavin on an expedition with Appa. Gary Daab with Apollo, riding the Telluride Gondola. Klondike is white on white. Because of their mellow temperaments, some CMDs make the best house dogs ever. Consult the breeder, and ask for a mellow pup, from mellow parents. Colorado Mountain Dogs, like many LGD breeds, are bred to lie quietly among their charges, and to fit in. Often, if they don't have a flock of sheep, they will accept a flock of kids, or even a flock of cats. This makes for a great house dog. But, a CMD left alone in a suburban back yard might make it look like a missile testing site in a day. They might eat 2x6s to get out, dig, climb, jump, and probably irritate the neighbors by barking at cats. CMDs need to be with their people, and to be taken out into areas where they can run. Weston Imer and Yoshee -- "Empathy"
"Smalls", (who is actually huge), owned by Chris Goods. Klondike's dad Bobby Recsh isn't feeling well. What is a guardian puppy to do? Bergen, owned by Karman Cusac. Contributed by photographer Elizabeth Galvin... and that is her Colorado Mountain Dog, Appa.